Cleric Anjem Choudary accuses British soldiers in Afghanistan of "murderous crimes." London, England (CNN) -- Britain is set to ban a Muslim group that recently caused outrage by proposing a demonstration in the town that receives the bodies of British war dead killed abroad, the Home Office said Sunday. The ban would prevent Al-Muhajiroun, also known as Islam4UK, from having meetings or raising money. Attending a meeting or being a member of Al-Muhajiroun or Islam4UK would be a criminal offense, a Home Office spokesman said. The spokesman declined to be named, in line with government policy. "Proscription is a tough but necessary power to tackle terrorism," said the Home Office, which is responsible for domestic security in the United Kingdom. Two offshoots of Al-Muhajiroun, Al-Ghurabaa and Saviour Sect Group, were banned in July 2006. The ban should come into force in a matter of "days, not weeks," the spokesman said. It would require approval from both houses of Parliament. The group's leader, controversial British Muslim cleric Anjem Choudary, has been threatening to stage a march as a protest against the war in Afghanistan. Choudary -- informed of the government's plans by CNN -- said the Home Office could not shut him down. "We're not going to stop because the government bans an organization," he told CNN by phone. "If that means setting up another platform under another label, then so be it." A ban "will just make the use of those names ... illegal, but Muslims everywhere are obliged to work collectively to establish the Islamic State and Sharia law in the UK or wherever they are -- those things can't change," he added. Asked if he was surprised or disappointed by the decision, Choudary said "No, not at all, we expect this and much more than that." His Web site appeared to have been shut down as of Sunday, apparently by Islam4UK itself. In place of a full Web site, Islam4UK.com now contains only a new, relatively conciliatory letter posted Saturday and labeled "An Appeal to Families of British Soldiers to have an Honest Dialogue," and a note saying "Islam4UK Back Soon." It was not clear when the Web site was scaled back. Choudary drew headlines last week by proposing a march through the English town of Wootton Bassett. The bodies of British war dead are traditionally brought to the town, near a Royal Air Force base, when they are returned to the country. As hearses carry the flag-draped British remains, relatives and friends, along with local residents, line the streets of the town in scenes of public mourning widely reported by British media. Choudary's proposal to march empty coffins through the streets drew fury and outrage. The march would be illegal if the group is banned, the Home Office said. 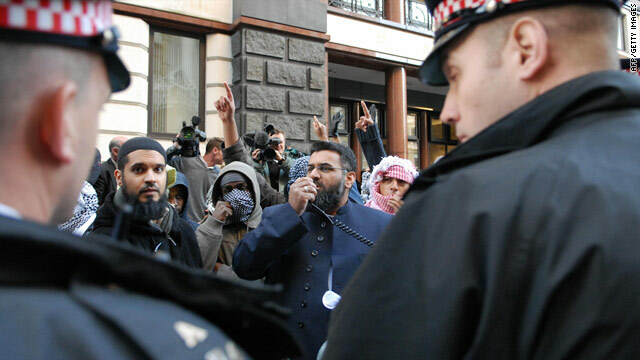 Choudary himself "would have to renounce membership to avoid breaking the law," the spokesman said. "His group should cease to exist." The decision to ban the group was made not only because of the plan to march in Wootton Bassett, the Home Office said. Choudary has never announced a date for his planned march, and local police said he had not contacted them about it, as people planning marches are required to do before staging a demonstration. But he published an open letter, "To the Families of British Soldiers who have died or who are currently in Afghanistan," on the Web site of Islam4UK on January 4. The group had earlier used a short statement on its Web site to announce its intention to stage the protest. In the letter, Choudary accuses soldiers of "murderous crimes," and says the United States and United Kingdom are seeking to "establish their own military, economic, strategic and ideological interests in the region." British and American troops are suffering "depression" as they realize "there is no real moral or ethic (sic) reason for them to murder innocent men, women and children to fulfill their politicians (sic) agenda," the preacher says. The threat of the march prompted more than 725,000 people to join a Facebook group opposing it as of Sunday, a week after Choudary posted a letter online justifying it. "The highway for heroes and wonderful people of WB do not deserve this march to happen," the group's home page says, in reference to Wootton Bassett. "This group can march anywhere it wishes in the country but have chosen WB to cause outrage & offense. Islam4UK is an extremists (sic) Islamic group and does not represent the Muslim community in this country." Choudary signs his open letter "UK Head of Al-Muhajiroun," describing it as a British group which supports al Qaeda. Choudary spoke positively of Osama Bin Laden in the letter and in interviews with British media last week. The new letter makes no reference to Bin Laden or his group. "Many people in Britain are grieving for their loved ones who have died or who are injured, just as we too grieve the loss of the innocent men, women and children in Afghanistan at the hands of the US led alliance," the new letter says. "In addition many people of Britain do not agree with the war and the oppression and injustice which is being perpetrated under the guise of fighting for freedom and democracy, just as we too want the British to withdraw their troops from Muslim land. With this common ground we must all demand that the British regime pull out from Afghanistan." In the new letter, Choudary denies planning to march empty coffins through Wootton Bassett. The Terrorism Act of 2000 gives the home secretary the power to ban groups if the punishment is "proportionate and based on evidence that a group is concerned in terrorism as defined in the Terrorism Act 2000," according to the Home Office. According to the law, groups can be banned if they commit or participate in acts of terrorism; prepare for terrorism; or promote or encourage terrorism. The Home Secretary can also take into account factors such as specific threats posed to the United Kingdom or British nationals overseas and the extent of the group's presence in the UK. The London branch of the moderate Islamic group Minhaj-ul-Quran International welcomed the Home Office announcement Sunday. "We have always supported the idea of banning extreme individuals and extremist groups from working in this country and have for a very long time been frustrated that they have been allowed to infiltrate universities and mosques to promote a message of hatred with their anti-West agendas," said spokesman Shahid Mursaleen. Founded nearly 30 years ago, and present in 90 countries, the group aims to promote religious moderation and a modern interpretation of the Quran. "For too long a small group of extremists are trying to hijack Islam and British Muslims," Mursaleen said. CNN's Jonathan Wald in London, England, contributed to this report.